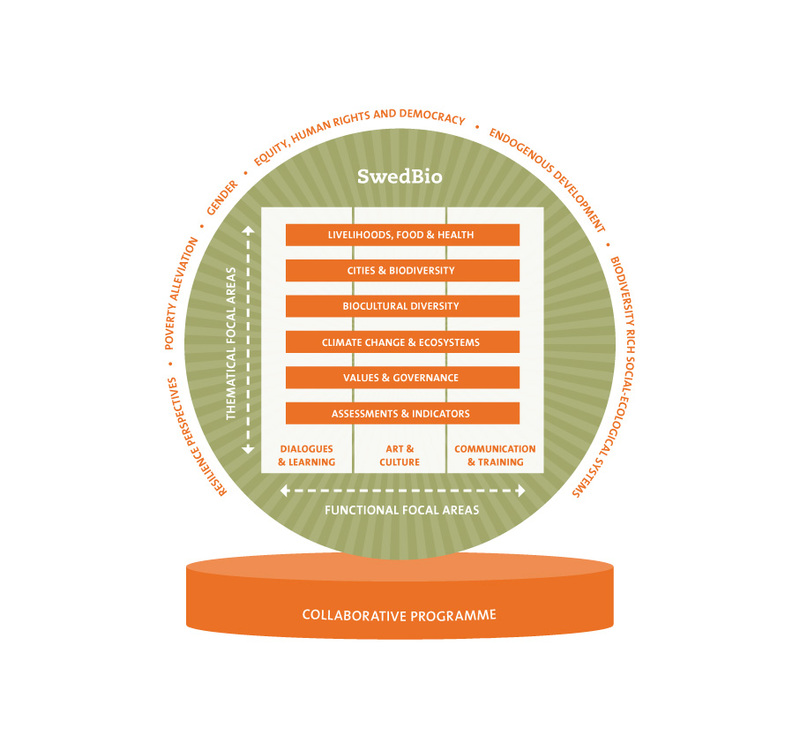 SwedBio is a knowledge interface at Stockholm Resilience Centre contributing to poverty alleviation, equity, sustainable livelihoods and social-ecological systems rich in biodiversity that persist, adapt and transform under global change such as climate change. SwedBio enables knowledge generation, dialogue and exchange between practitioners, policy makers and scientists for development and implementation of policies and methods at multiple scales. Earth’s biological resources are vital to humanity’s economic and social development. Biodiversity and biological resources provide the basis of life-support functions and resilient ecosystems and deliver vital ecosystem functions and services such as food, water purification, soil fertility and climate regulation. These services, and the biodiversity on which they are based, are crucial resources for the world’s poorest people. They contribute to local livelihoods, and economic development. In addition, they are essential for the achievement of the Sustainable Development Goals. These include ending poverty, ending hunger, achieving food security and improved nutrition, ensuring availability and sustainable management of water and for taking urgent action on combating climate change and its impacts. Ecosystems are a central component of many belief systems, worldviews and identities. Overwhelming evidence, summarised comprehensively in the Millennium Ecosystem Assessment, has clearly demonstrated that humans have changed ecosystems more rapidly and extensively in the last 50 years than in any other period in history. This is also emphasized by recent research on the new trajectory of the Anthropocene, clearly illustrating the unprecedented impact of human activities on a planetary scale. This has contributed to substantial net gains in human well-being and economic development, but at the expense of considerable and increasing degradation of biodiversity rich ecosystems and the majority of ecosystem services. According to the Global Biodiversity Outlook 4 (CBD 2014), species that have been assessed for extinction risk are on average moving closer to extinction. Nearly a quarter of all plant species are estimated to be threatened with extinction. Crop and livestock genetic diversity continues to decline in agricultural systems. The 2030 Agenda for Sustainable Development recognises that natural resource depletion and adverse impacts of environmental degradation, including loss of biodiversity, add to and exacerbate the list of challenges which humanity faces. Biodiversity is well recognised in the Sustainable Development Goals not just in the Target 15 on Ecosystem and Biodiversity and Target 14 on Oceans, but integrated across the 17 goals and 169 targets, acknowledging that biodiversity is fundamental to human well-being (UN, 2015 ). SwedBio was established by the Swedish International Development Cooperation Agency (Sida) in 2002 to meet the growing international concern regarding negative effects on biodiversity and the need for joint policies and strategies to deal with global environmental challenges. The deep connections between environment and development are at the heart of everything that SwedBio does. Social-ecological resilience is therefore a natural conceptual approach for our work. In the knowledge interface role, the aim is to facilitate connections across knowledge systems and cultures, such as local, indigenous, policy makers and scientific knowledge, and between diverse actors such as practitioners, policy makers and scientists – the intention is to contribute to improved understanding, knowledge generation, management and good governance of social-ecological systems. Together with partners, SwedBio has organised a number of multi-actor dialogues, which have contributed to important international policy and practice processes – all of which have relevance for developing countries. In its knowledge interface role, SwedBio collaborates with a broad spectrum of partners. In the Collaborative Programme SwedBio contributes to a limited number of organisations and strategic initiatives in developing countries (low income countries and least developed countries) working on issues related to our objectives. When bridging in-between different knowledge systems and actors it is important to have a clear framework and transparent principles and procedures to guide the motivation, character and intent of the various collaborative initiatives undertaken. SwedBio applies a set of guiding principles in all knowledge collaborations, and there are a number of cross-cutting issues that underpin all SwedBio’s operations. SwedBio is funded by the Swedish International Development Cooperation Agency, Sida.